This past weekend was a historic moment for Garth Pischke and the Bison men’s volleyball team. 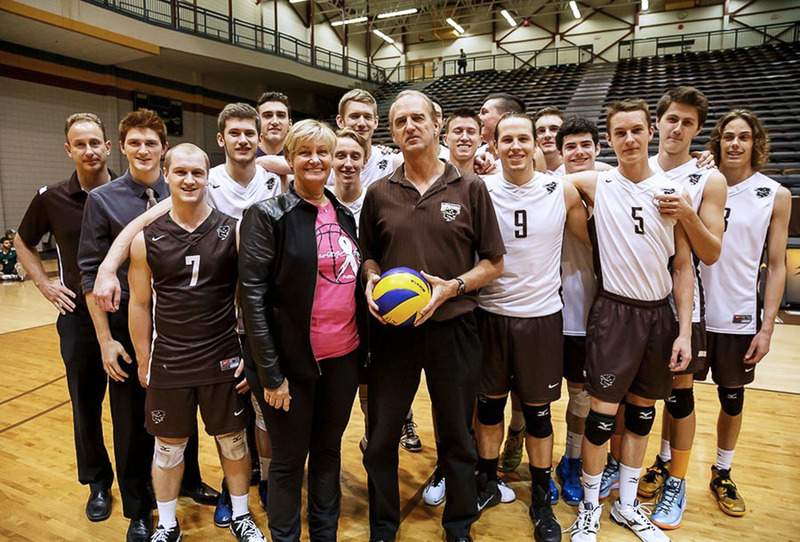 The team rallied together and fought to earn a 6-0 sweep of the Regina Cougars, elevating coach Garth Pischke into the record books as the most winningest volleyball coach in North America with a total of 1,240 wins. Pischke moved past former UCLA men’s volleyball head coach Al Scates, who had a record of 1,239-290 in his 50 seasons at the helm. Pischke had his team looking sharp in their weekend matchup. Leading the way over the two matchups for the Bisons was libero Alex Strachan with 18 digs, Devren Dear with 20 kills, and Kenny Rooney with 10 blocks. Friday night saw a strong attack with Dear picking up seven kills, Kevin Falconer with 10, and Adam DeJonckheere with 11. Timely attacks and defence played a big role in Friday night’s win as the Cougars pushed the attack in each set to always stay within a few points. Saturday was a different story as the Bisons dominated the Cougars 25-17, 25-17, and 25-18 in sets. Dear had a big night as he threw down 13 kills against the Cougars. Falconer helped the attack with eight kills and Rooney led the team up front with six blocks. The Bisons improve to 3-1 on the season, which places them in third place in the Canada West. The next men’s action occurs on Oct. 24 and 25, as the Bisons travel to Kelowna, B.C. to take on UBC Okanagan. Bison co-captain Rachel Cockrell racked up 38 kills this weekend as Manitoba took both games in a weekend series against the Regina Cougars. Cockrell is in a league of her own, dominating Canada West with 93 kills, almost double what the next highest kills leader has managed to rack up this year. The Bisons entered the weekend matchup on the heels of a disappointing loss in their home opener. The team was focused and determined to win as they controlled the Cougars throughout the match on Friday night, winning 25-19, 25-22, and 25-17 in sets. Libero Cassie Bujan had a solid showing, in her first start of the season on Friday night, leading the team with 13 digs. Cockrell had a standout game on Saturday, leading the team with 22 kills, 14 digs, and a service ace. Brittany Habing had a strong showing, helping her teammates with a total of 33 assists. Habing is currently tied for the CIS lead in assists with 149 on the season. Bujan also had another solid showing with 13 digs. The Cougars came out with a much stronger showing on Saturday but the Bisons stood tall. Defensively, the Bisons received contributions from all of the team, with Jordana Milne and Habing contributing seven digs each and Kalena Schulz adding six. Milne and Sarah Klassen helped round out the offence. Klassen had seven kills and Milne had six. The Bisons now move to 2-2 on the season and look to pick up their championship form from last year. Manitoba will head on the road this weekend for the first time, taking on UBC Okanagan on Friday, Oct. 24 and Saturday, Oct. 25.